Set in Boston, Massachusetts in 1959, Curtains follows the fallout when the supremely untalented star of Robbin' Hood of the Old West is murdered during her opening night curtain call. 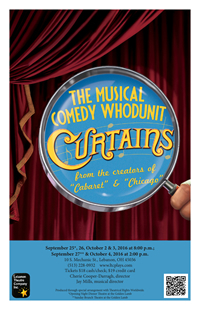 It is up to Lt. Frank Cioffi, a police detective who moonlights as a musical theatre fan, to save the show, solve the case, and maybe even find love before the show reopens. All without getting killed himself. With music by John Kander and lyrics by Frank Ebb, This Tony-winning Broadway classic is not to be missed. The books, the papers, the photos,...they belonged to a preacher. A preacher who lost his way. There are clues in these personal effects. Clues that may suggest his journey. His sermons hauntingly preserved on a deteriorated audio cassette. Could this recording serve as a bridge to the spirit world? Will he reach across the veil to tell us his story...or will something else come through...something uninvited? 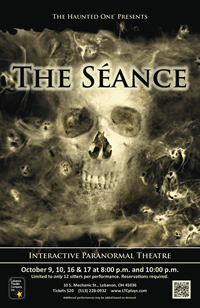 Each performance of The Séance is limited to up to 12 guests (Sitters), who will be active participants. Nothing for you to prepare;* just a willingness to embrace your fears, and to experience what may lie on the "other side." *IMPORTANT NOTE: Okay, there is one thing you may have to prepare for. If you typically require reading glasses, please be sure to bring your glasses to the event. Doing so will facilitate your participation in certain aspects of the interactive event. We look forward to ringing in the new year with our annual fundraising gala. This year's theme is Puttin' on the Glitz. This show will be a nostalgic look back at the 20 year history of LTC, with selections from many of our audience's favorite shows from the past two decades. The show will be preceded by a fabulous dining experience at The Golden Lamb, and intermission will feature a basket raffle and delightful desserts. As you know, this is the one major fundraiser that we host each year. The gala provides a substantial portion of LTC's operating costs.Without a successful gala to start the year, we wouldn't be able to provide a full season of great shows for you and your neighbors to enjoy! We hope that you will be able to join us for this can't-miss event. Help us kick off 2016 with a bang and make this the biggest and best gala ever! 6pm social time at The Golden Lamb (cash bar and appetizers); 6:30pm dinner at The Golden Lamb; and 7:30pm show at our Mechanic St. Theatre. 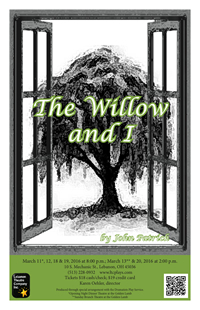 The Willow and I tells the story of two sisters in 1900, that are in love with the same tall, young man. One of the sisters is frail and gentle. The other robust and assertive. It is the gentle girl that the young man loves but never marries because the other sister threatens to kill herself just before the wedding. The bride's mind recoils, and for forty years the girl lives in her clock-stopped mind on her summer wedding day. And then, she awakens. Her lover married her sister; they had a son who is very like the father. You may guess whose face she first sees and what it does to her. 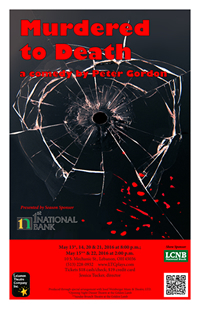 Murdered to Death introduces the inept and bungling Inspector Pratt, who battles against the odds and his own incompetence to solve the murder of the house's owner. It soon becomes clear that the murderer isn't finished yet. Will the miscreant be unmasked before everyone else has met their doom or will the audience die laughing first? ​The first in a trilogy of Agatha Christie spoofs, this hilariously clever whodunit is sure to be a wicked delight. Please see our Tickets page for show times and ordering tickets. ​Season is subject to change due to unforeseen circumstances.